The swallows have long departed, replaced by sinister crows of dark omen. The land has grown more desolate, and travel ever more dangerous since a traitor was discovered in our midst. Rumor has it that Merlin himself is now scouring the plains around Camelot, rallying new knights to our cause. But will that prove enough to counter Morgan's newly assembled coven of witches? 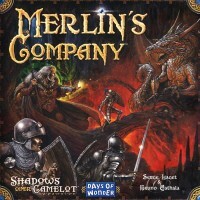 While Shadows Over Camelot is not be a perfect game (few are), I do think that Merlin’s Company is a perfect expansion for it. Honestly, I was highly skeptical of obtaining this expansion, but I’ve been won over. Why? What do you get with the Merlin’s Company expansion? Plenty. 1) New versions of all the knights (except King Arthur) – all of which are fun and balanced. (My favorite is one that allows you to roll the siege engine dice BEFORE you lay down cards. 2) A new knight – Again, not a game changer per se but a quality addition who allows you to exchange a white card in your hand for one that you draw. 3) Merlin! He might accompany you on a quest, which allows you to draw a card for free each round while he is there or he can block the placing of siege engines if he is hanging out at a completed quest. 4) Some powerful new good and evil cards. Again, beautifully balanced and easily incorporated. 6) A new mechanic that requires knights to draw from a new deck when traveling to a quest. This deck sometimes says all is quiet, sometimes moves Merlin into play, and sometimes attacks, hinders, or captures the knight attempting to move. Most folks say the expansion makes this challenging game even harder. However, my experience (thus far at least) has been quite the opposite. With Merlin frequently allowing extra card draws or stopping the placing of siege engines, I have found the game much more beatable. Regardless, I think this expansion makes the game much more thematic and enjoyable. If it proves to make the game harder, I will like it even more as the sense of satisfaction from beating the game will increase. I have not heard of any more planned expansions for the game and frankly, it does not need any as the game now feels fully complete. Shadows over Camelot has proven itself a successful co-op game which was one of the first to incorporate a potential element of betrayal which really ramps up the fun. I believe Merlin’s Company to be a perfect expansion of the game for it keeps all the best elements, adds some variety and power, and really ramps up the thematic elements of the game. If you are a Shadows over Camelot fan, don’t be late in expanding the fun! Being an expansion, this is not playable without the base game. If you are interested in learning more about Shadows over Camelot, be sure to check out its page. This expansion does more than add cards and characters, it also changes how the game operates on certain levels. First off, you get seven new knights. Each has various new powers, but the coat of arms they possess are shared with the existing knights. What this means is that you cannot play both Sir Gaheris and Sir Galahad in the same game, for instance, because they share the yellow coat of arms. There is a new rule requiring the use of King Arthur, which I frankly thought was necessary anyway because not having his power in the game was nearly debilitating. In addition, there is now a Merlin figure. He wanders about from quest to quest. Should your knight be at a quest that Merlin is currently present, you can draw a white card as a free action. If Merlin is sitting at, say, the grail quest and that quest is complete, black cards drawn with that emblem that normally would add a siege engine are instead discarded with no effect. You may now play up to 8 players, but then there will be two traitors. The traitors do not know each other until revealed, but this can make the distrust aspect of the game much greater, and having two unrevealed traitors at the end of the game nets you three white swords being turned to black. There is also a host of new special cards added, and some standard cards come with it just to try and keep balance. The rules have changed now so if a black card that affected a quest that has been completed is drawn, a siege engine is still added, but that card is permanently discarded and will not be reshuffled into the deck again. Overall, I say that unless you are playing with 8 players and two traitors, this expansion makes the game easier. If you and your group like the game but find it very difficult, or just want some new knights in the mix, this would be a good buy. For me, I do not dislike the expansion, but I am not wild about the game anyway. The expansion does not really do anything to add to or detract from my enjoyment of the game. Take that for what it is worth. Our family really enjoys the basic version of Shadows over Camelot. This expansion probably adds a little too much complexity for the family crowd, but it’s just the right amount of magical spice for those who need some extra challenge in Arthur’s kingdom. But the chance for two traders, an 8th player, and adding variety of new knight makes this a great expansion for fans of the original. Add a Review for "Shadows over Camelot: Merlin’s Company"